I am pleased once again to share with you news from the Committee on Alcoholism and Drug Abuse. As I look back on my experiences as chairman of the committee in 2004, I'm struck by several things. I am disappointed that Governor Pataki has not been supportive of efforts to bring quality chemical abuse treatment to people in our communities who desperately need it. In his 2004 budget submission to the legislature, the Governor slashed millions of dollars from the agencies on the front lines of the battle against substance abuse. Then, after the legislature passed a budget that helped address the crisis of addiction, the Governor vetoed items that would have brought much-needed funding to treatment programs. I am, however, pleased that some changes to the draconian Rockefeller Drug laws finally were enacted in 2004. The Assembly has been in the forefront of advocating for drug law reform for many years. This year the Governor and the Senate finally signed on to some changes. While we made changes in sentencing, there is still much reform to do. Two key reforms were not agreed upon: greater judicial discretion and incarceration alternatives. Without these changes it is hard to argue that real reform has taken place. Nonetheless, the changes regarding sentencing that were made will positively affect hundreds of New Yorkers. During 2004, the Committee hosted several public hearings and roundtable discussions to give citizens the opportunity to comment on the state's role in funding substance abuse services. We heard from many individuals, families and organizations who are stakeholders in the fight against addiction. Overwhelmingly their message was clear - fighting substance abuse DOES matter. With your support, we will continue to make a positive impact on the lives of New Yorkers who suffer from the horrors of addiction. My goal continues to be securing appropriate funding for substance abuse treatment and prevention - to make our communities safer and keep our families together, and to reduce the terrible costs that addiction places on our healthcare, criminal justice and welfare systems. I look forward to working with substance abuse treatment and prevention providers to build on the Assembly's longstanding commitment to helping fight substance abuse, and I am certain that together we will achieve success on this critical issue. Assemblyman Dinowitz participated in the opening ceremony of the Employment Program for Recovered Alcoholics (EPRA) located on Grand Concourse in the Bronx. 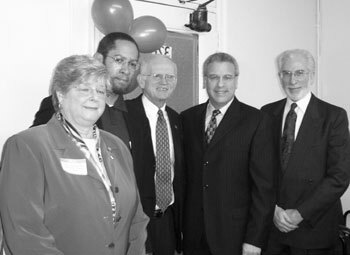 Pictured L to R are: Eileen Kopf-Walker, Executive Director of EPRA; Assemblyman Michael Benjamin; Dr. William Gorman, OASAS Commissioner; Assemblyman Dinowitz; and Dr. Lloyd Sederer, NYC Department of Health and Mental Hygiene Executive Deputy Commissioner. The Assembly Committee on Alcoholism and Drug Abuse and the Committee on Health held a joint hearing on hepatitis and methamphetamine use. 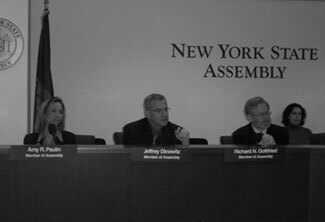 Assemblyman Dinowitz is shown here with Assemblywoman Amy Paulin (on his left) and Health Committee Chair Richard Gottfried (on his right). On January 7, the Assembly Committees on Alcoholism and Drug Abuse and Health held a public hearing to determine the prevalence of hepatitis and the use of methamphetamine in the state, gauge the effectiveness of current efforts to combat these phenomena, and determine what further steps are necessary to address these critical public health issues. Witnesses who provided testimony at the hearing included government officials, healthcare, drug abuse and mental hygiene treatment providers, persons with hepatitis and other stakeholders and interested parties. The testimony made it clear that thousands of New Yorkers have viral hepatitis, and hepatitis is a particularly significant problem among injection drug and methamphetamine users in New York City. As is the case with HIV, high-risk sexual behavior in combination with drug use greatly facilitates the spread of hepatitis. The problem is worsened by the fact that viral hepatitis can be insidious. Frequently, symptoms of infection are mild or nonexistent, so people may not even know they have the disease. Those who do have symptoms might experience "flu-like" symptoms such as fatigue and nausea, but if they don't have the means to pay for treatment or are reluctant to seek treatment due to their involvement in illicit drug use, the disease can go undiagnosed and untreated. Several experts testified that with similar risk factors, transmission modes and at-risk populations, the current challenges of viral hepatitis, especially hepatitis B and hepatitis C, resemble those of HIV in the late 1980s and early 1990s. Needless to say, we all know too well the tragedy that resulted from the delay in recognizing and addressing the HIV epidemic. It is the Committee's hope that this hearing will help raise awareness of the hepatitis problem, and after the hours of testimony are reviewed, Chairman Dinowitz and other members will be considering new legislation that will help better coordinate New York State's response to this growing crisis. The Committee on Alcoholism and Drug Abuse also held a public hearing to determine whether the treatment system in New York State has the capacity - the funding, the physical space, the staffing, and other resources - to meet the demand for service and provide the highest possible quality of care. The Committee heard testimony on how proposals like Rockefeller Drug Law reform will impact the system's ability to meet demand, so that we can begin to plan for a huge increase in demand for services if it eventually occurs. Dozens of substance abuse treatment providers and other stakeholders and interested parties testified that the treatment system in New York State currently does not have the resources it needs to work at maximum efficiency and ensure positive outcomes. With demand for addiction treatment high, several witnesses testified that they are working at or near their maximum capacity. Some witnesses even reported being forced to place persons in need of treatment on waiting lists, because the demand for services is too high and resources too limited. They fear this unfortunate situation will be exacerbated if drug law reform in New York State eventually results in scores of addicted persons being diverted into treatment instead of incarceration. The hearing drove home the point that without adequate financial support from the state, our best efforts to combat the scourge of addiction will not be as successful as they should be. As Chairman of the Committee on Alcoholism and Drug Abuse, Assemblyman Dinowitz considers it the Committee's number one priority to fight for the funding we need, despite the opposition we consistently face from the Governor. During the past several years, the Committee has been critical of Governor Pataki for the sorry state of New York's funding of alcoholism and drug abuse treatment and prevention programs. In a recent letter to William Gorman, the Commissioner of OASAS, Committee Chair Jeffrey Dinowitz cited the scandalous news of Senate Majority Leader Joseph Bruno's brother's secret, extravagant office in Saratoga Springs as an indication of the governor's continued dysfunctional leadership of the alcoholism and drug abuse field. Given the sorry state of New York's funding of these much-needed programs, every effort must be made to put every available dollar where it is needed the most: into the programs that actually help people. That is why the Committee was both disappointed and angry to learn that State dollars were being used to fund an opulently appointed, special office for Deputy Commissioner Robert Bruno in Saratoga Springs. It was even more disturbing to read that the company that owned the space was partially owned by a political leader in Saratoga Springs. As a result of the outcry and the pressure placed on Robert Bruno by private citizens, government officials and the press, he resigned from his job in disgrace. In the wake of the resignation, the Committee urged the commissioner to conduct a thorough review of OASAS expenditures to determine whether there are other unnecessary expenditures that can be eliminated in order to increase funding for treatment and prevention. During this period of fiscal uncertainty in New York, there is considerable debate about the role of Medicaid funding, which is used to pay for some drug and alcohol addiction treatment services. The Assembly Committee on Alcoholism and Drug Abuse convened a roundtable in New York City to explore the use of Medicaid funding for addiction treatment, and to create a forum wherein treatment providers, government and other stakeholders could exchange information and develop strategy for the optimal use of such funding for substance abuse treatment. What the Committee heard regarding the use of Medicaid monies to fund drug and alcohol treatment was extremely interesting, and a bit alarming. There are many crucial treatment providers who have been adversely impacted by recent changes in Medicaid regulations, in fact some providers have been put in jeopardy of losing both State financial assistance and Medicaid monies, which will almost surely lead to programs closing or drastically curtailing services. We must remain vigilant in our efforts to keep Medicaid costs at a sensible level - time and again the committee has heard how much our communities benefit from the positive outcomes of chemical abuse treatment. Treatment works to greatly improve the lives of our neighbors and even our loved ones who may be suffering from chemical dependence. It helps them avoid crime, stay healthy, do well in school, hold down a job, pay taxes, give back to their communities and become productive members of society. The Governor should be figuring out ways to expand treatment options for those in need, not cutting funding and creating draconian rules and regulations that do nothing more than make New York less healthy and less safe. 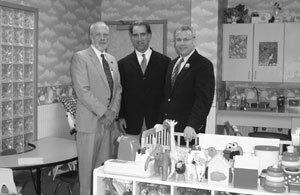 Assemblyman Dinowitz visited Syracuse Behavioral Healthcare in Syracuse. One of the highlights of this visit was peeking into the day care room used by clients with children. 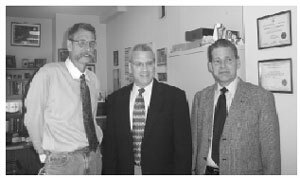 Left to right: Rick Kinsella, Vice President, Syracuse Behavioral Healthcare; John Coppola, Excecutive Director, ASAP of NYS; Assemblyman Dinowitz. Committee Chair Dinowitz recently toured several Syracuse-area substance abuse treatment and prevention programs with his Legislative Director Ryan Miday, Committee Analyst Bill Eggler, and John Coppola from the NYS Association of Alcoholism and Substance Abuse Providers Association. One of the stops on the tour was Central New York Services, Inc., an agency dedicated to providing support and advocacy to those who are most at risk and underserved. Central New York Services, Inc. provides counseling, residential services and support to individuals and families. We observed the Continuing Day Treatment program at Central New York Services, which provides structure and support to persons suffering from both chemical dependency and mental illness. The clients allowed us to sit in on a group therapy session designed to help them achieve mental health stability, and we heard moving stories of how the program was helping them deal with their problems and addictions, and get their lives in order. It is always an eye-opening experience to see the incredibly positive role addiction treatment plays in the lives of people such as those we met at Central New York Services, and we were grateful to them for making us feel welcome. Syracuse Behavioral Healthcare (SBH) provides a variety of treatment options to clients with special needs for family services, co-occurring mental disorders, and involvement in the criminal justice system. We toured SBH's West Onondaga site, a Supportive Housing Program, which provides housing for persons in recovery from addiction. Residents of the site work to maintain progress in recovery from addiction, while completing the transition to independent housing and income. SBH's Harriet May Mills House is a national historic site that had been home of the prominent women's rights advocate Harriet May Mills and her family of political reformers. SBH is renovating this beautiful old home which will serve as a halfway house for women in recovery from chemical dependency. The Harriet May Mills House will be the first new halfway house in Syracuse, since 1969. 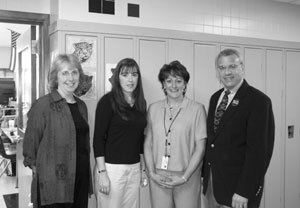 The Alcohol-Drug Abuse Prevention Education Program (ADA-PEP), run by the Onondaga-Cortland-Madison BOCES, is a school based substance abuse prevention program that provides school districts with information, education and counseling services at the elementary, middle and high school levels. Established in 1971, ADA-PEP is funded by the OASAS, the Onondaga County Department of Mental Health and the participating school districts. It is the largest school based prevention program in New York State outside of New York City, with 41 full and part time counselors in 17 school districts in Onondaga and Madison counties. We visited Mrs. Bertone's class at the Gillette Rd. Middle School in North Syracuse, and sat in on one of the classroom presentations by the BOCES instructor Elaine Ormsbee. The lesson was designed to help the students recognize and deal with stress. Armed with this knowledge, children can avoid turning to alcohol, drugs or violence to deal with the problems they face every day. Assemblyman Dinowitz visited Stay'n Out, a therapeutic community for inmates at Arthur Kill Correctional Facility in Staten Island. Pictured, L to R: Seep Varma, Regional Director, Stay'n Out; Curtis Muhammed, Senior Counselor, Stay'n Out; Darryl Eaton, Senior Counselor, Stay'n Out; Assemblyman Dinowitz; Ronald Williams, President/CEO, Stay'n Out; Superintendent Dennis Breslin, Arthur Kill Correctional Facility NYS DOCS; Deputy Superintendent Valarie Sullivan, Arthur Kill Correctional Facility NYS DOCS; John Coppola, Excecutive Director, ASAP of NYS; Bill Eggler, NYS Assembly. Assemblyman Dinowitz visited Camelot, an adolescent treatment center in Staten Island. 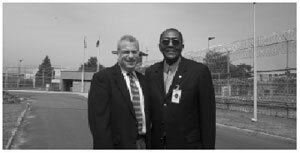 On the Left Is Joe Alexander, Assistant Director of Camelot's Male Residential Facility and on the right is John Coleman, Camelot's Director of Operations..
Outside of Arthur Kill Correctional Facility, Assemblyman Dinowitz stands with Ron Williams, President and Founder of Stay'n Out. As Chair of the Alcohol and Drug Abuse Committee, Assemblyman Dinowitz travels across New York State, touring treatment facilities and meeting addiction counselors and clients. This past summer he had the opportunity to visit a very impressive program, the Stay'n Out men's therapeutic community facility at Arthur Kill Correctional Facility on Staten Island. Therapeutic communities (TC) are intensive residential drug treatment programs, and the TC model views drug abuse as a disorder of the whole person, reflecting problems in conduct, attitudes, values, moods and emotional management. The specific goal of treatment is the development of a lifestyle marked by abstinence and the elimination of antisocial behaviors and attitudes. After completing the 9 to12-month prison-based therapeutic community program, participants of Stay'n Out are encouraged to continue substance abuse treatment after release through community-based programs. Stay'n Out has been found to reduce recidivism; only 27% of Stay'n Out participants were rearrested after parole, compared with 35% - 40 % of those in counseling-only or no-treatment groups. These findings indicate that the therapeutic community participants had a significantly lower percentage of arrests than that of the other groups. The Stay'n Out program proves that providing addiction treatment to prisoners reduces recidivism much more than no treatment, and that benefits more than just those in the program. Treatment makes our communities safer and healthier, and we all benefit from that. Unfortunately, as we have come to expect, Governor Pataki doesn't agree. 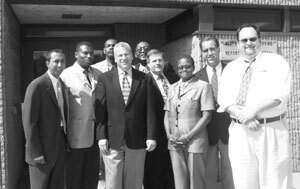 Not long after Chairman Dinowitz visited the program, it was announced that Stay'n Out was having their funding cut, as a result of the governor's ill-conceived budget vetoes, leaving us to conclude that Governor Pataki simply does not care if many prisoners are released back into our communities with no hope of breaking the cycle of addiction and crime. As the 2005 legislative session gears up, I am hopeful that reform of the way Albany does business will help bring about an end to legislative gridlock and late budgets that have plagued New York for so long. I would like to believe that when the Governor submits his budget to the legislature he will finally get the message that addiction treatment works, and will accordingly provide the level of funding that is needed to make sure everyone who needs treatment can get it. But if experience is any teacher, I'm forced to predict that the Governor will not make wise choices - cutting much-needed funding for programs that help make our communities healthier and safer. Under the leadership of Speaker Sheldon Silver, the Assembly has time and again fought to make sure that the Governor's punitive budget cuts would not be allowed to stand unchallenged, and that fight will be no different this year. The Assembly Committee on Alcoholism and Drug Abuse will continue to be in the forefront of the state's fight against substance abuse.